Reading United pulled off a major upset Wednesday by knocking off the NASL champion New York Cosmos 3-2 in the U.S. Open Cup’s second round. United came back from a goal down to reel off three straight goals in less than 10 minutes, with Paul Marie, Marco Micaletto, and Frantzdy Pierrot netting in the 38th, 42nd, and 44th minutes to go into halftime up 3-1. Former U.S. international Danny Szetela then won a goal back for New York with a diving header in the 63rd minute, and Reading spent the rest of the game soaking up pressure and defending desperately. Reading lost Mo Adams to a second yellow card in stoppage time, but the side held firm in the end to advance in the cup. Reading wasn’t the only non-professional side to upset a professional team Wednesday. PDL power Michigan Bucks defeated another NASL side, Indy 11, 1-0. Christos FC of Baltimore knocked off the USL’s Richmond Kickers 1-0. Chicago FC United beat the USL’s Pittsburgh Riverhounds 3-1. 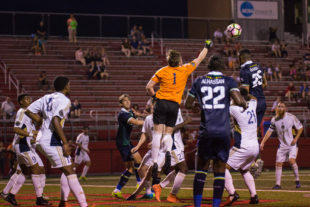 Local side Ocean City Nor’easters almost became the fifth team to pull off an upset, but they fell to the Harrisburg City Islanders of the USL after seven rounds of penalty kicks. Reading and Harrisburg will now meet in the cup’s third round, with Reading hosting the match on May 31 at Don Thomas Stadium in Exeter. This is great news for the Union as well! If the Cosmos had advanced through it was looking like the Open Cup musical chairs would pair us against the Jersey Pink Cows in the 4th round. Now the two NY (area) MLS teams could find themselves facing off in round 4. You have to like our chances to go far if we can avoid one (or both) of the New York teams. I have no idea who the Reading Rage are or how they fit in the system, but I’m always happy to see the Cosmos lose, whether it be 1977 or 2017. There was a time when some online fans of these Cosmos seemed to think that winning the U.S. Open Cup, and thus getting to the CONCACAF Champions League without having to mess around with MLS, was going to be a piece of cake. There even was some talk of the Club World Cup. But that was then.